The Quickest Electric Car in the World! Speedworld Motorplex, northwest of Phoenix, on September 17, 1999. That's right, he broke the 9 second "barrier"
just a couple months after breaking the 10 second barrier. The Electrified Motor Sports car continues to dominate electric vehicle drag racing, breaking its own records again, and again, undefeated for more than 6 years! CURRENT ELIMINATOR IV is on the move!!! body of the car for decals; Dennis is looking for a new major sponsor. Dateline: Bandimere Speedway, Denver, Colorado where Dennis Berube's 160,000 Current Eliminator III is set to break his drag racing world record. The start line traffic lights hit green and the Eliminator's huge rear tyres yelp in protest as he takes off. But that's the only noise the spectators can hear. The initial acceleration is unreal, cartoon-like, as if the car is being catapulted forward on a giant, invisible bungee rope. Listen more carefully and there's a muted whine rising in pitch down the track and the hissing of sticky rubber on tarmac. Berube glides to the finish line, surfing down the strip on a vast surge of noiseless power. Eliminator is running like a dream today and he records a new quarter-mile time of 10.229 seconds, with a terminal speed of 122.61 mph. He's done it - pushed the record still higher. For electric dragsters. The hushed crowd, who've come here to see things roar, scream and spew fire aren't sure what to make of it. They seem baffled and impressed in equal measure but decide to give the run a polite round of applause. 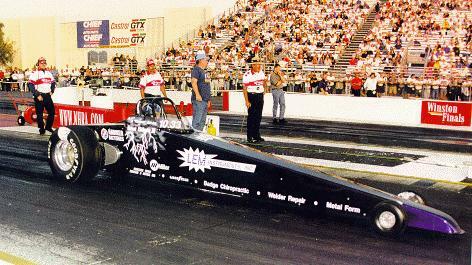 Current Eliminator III's Dennis Berube has been winning longer than most. Since he started in 1993, Berube, from Phoenix, Arizona has remained the man to beat. He regularly races , and humiliates, hardened gas-guzzlers. Berube's confidence is such that recently offered a $1,000 bounty to anyone who could beat him over the quarter mile. Is he expexting to pay up today? "No. The wager's off now," he announces, I gave it to the kids in Denver after the school shooting. I used it to set up a fund to get the children interested in racing." Dennis Berubé is here, unloading his purebred dragster from a long, white, professional-looking box-shaped trailer that he's hauled from his home in Arizona. The navy blue racer is decorated with spiffy electric-discharge patterns in special reflective paint. On its rear, in block letters just above a big on/off switch, is a challenge: "$1,000 TO ANY ELECTRIC QUICKER." Berubé's car holds the current world speed record for any electric vehicle, and he has a standing cash offer to anyone who can shut him down. He's suntanned, amiable, low-key, without the edge that you'd expect from a speed maniac. In fact his modest manner and large-lensed glasses make him look like a clerical worker - although the appearance is deceptive. "I've always liked drag racing," he says. "When I was a kid I raced electric slot cars. I'd tweak them and soup up the motors, race against other kids in the neighborhood - and take their cars home with me." His first real car was a '65 Buick Grandsport, which he raced in suburban Connecticut. "I used to run every Friday night with maybe 1,000 people, right on the freeway. The cops would be there, but there were too many of us for them to do much about it. We'd make the windows rattle on the McDonald's. You could get 120-octane Sunoco back then, for 29 cents a gallon." He smiles at the memory. Eventually Berubé relocated to Phoenix, where he started his own welding repair business. 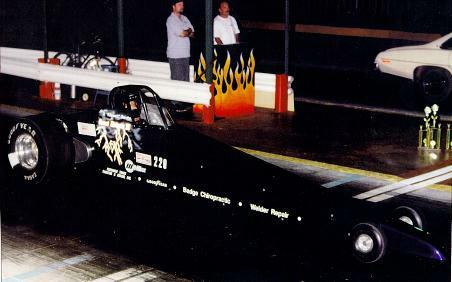 "In 1991 I had a service call at a racing shop where they built dragsters. I repaired their welder in five minutes and talked to the guy for three hours about an electric dragster. I said, 'Let's do it!' So they built it for me - an orthodox chassis to NHRA supercomp specs. I have 28 batteries, giving 336 volts at 1,200 amps. The cables are about an inch in diameter." So far, the car has cost him about $90,000, but it's cheaper and easier to run than a comparable gas-powered dragster. There's less maintenance and no tune-ups, and after each race a recharge from his portable generator costs about 30 cents. I ask him how the car feels when he takes off. "It's a kick. I cover the first 60 feet in 1.3 seconds. You feel the acceleration pull your face back. I do one-eighth of a mile in 6 seconds, reaching 105 mph. The last eighth, the performance falls off because I have no transmission. There's so much torque from the motor, it cracks gears." Like others in NEDRA [the National Electric Drag Racing Association], Dennis Berubé is an eco-evangelist. "When people see my car, they realize electric cars don't have to be like golf carts. So, this is the right thing to do - for ecology, and to get kids interested in the whole idea." And, if you can read German, here's an article from the 6/21/99 issue of Der Spiegel on the electric drag racing phenomena: derspiegelarticle.pdf (212KB; Adobe Acrobat reader required). vehicle related links see the Current Eliminator II page.